Why is your newborn baby's head not round? What causes the shape, and how long will it last? How can you care for your newborn at home? Labour and delivery can be hard on a baby's body. Your newborn baby may look a little less than perfect in the first few days or weeks after birth. His or her head may not be round. It's important to know that whatever caused this, it doesn't mean your baby's brain has been injured. The things that make a baby's head not look round usually happen outside of the skull. Your baby's head is more likely to look this way if you had a long labour and a vaginal delivery. The shape may also be caused by the way your baby's head rested against your pelvic bones while the baby was inside your uterus. Or it can happen if your doctor used forceps or suction (vacuum-assisted delivery) to give your baby a little extra help coming through the birth canal during delivery. Your baby's head should start to have a more rounded shape in the days and weeks after birth. Three main things can cause your baby's head to look the way it does. How long this shape lasts depends on the cause. Moulding: Your baby's head can be "moulded" as he or she moves through the birth canal. 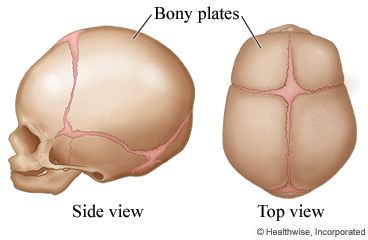 The pressure inside the birth canal can make the bony plates in your baby's skull shift and overlap. This can make your baby's head look stretched out or pointed at birth. Moulding usually goes away in the days after birth. During this time, the bony plates should move into a more rounded shape. Fluid under the scalp (caput succedaneum). Your doctor may call this "caput." It happens when fluid collects under your baby's scalp and causes swelling and bruising. Caput often appears on top of a baby's head and toward the back. It can make your baby's head look stretched out or lopsided. The swelling and bruising should go away in a few days. Blood under the scalp (cephalohematoma). Pressure inside the birth canal can cause blood to collect under your baby's scalp and cause swelling. This can make your baby's head look stretched out or lopsided. It doesn't usually cause bruising. It may take 1 or 2 weeks for the swelling to go away. You don't need to take any extra steps to care for your baby's head. At your baby's well-child checkups, your doctor will keep checking your baby's head shape and skull growth. If you're concerned that your newborn's head hasn't returned to a normal shape within weeks after delivery, talk with your doctor. Follow-up care is a key part of your child's treatment and safety. Be sure to make and go to all appointments, and call your doctor or nurse call line if your child is having problems. It's also a good idea to keep a list of the medicines your child takes. Ask your doctor when you can expect to have your child's test results. Enter I559 in the search box to learn more about "Learning About Head Shapes in Newborns".